Different ecosystems (ecological systems) support very different and often specially adapted plants and animals. 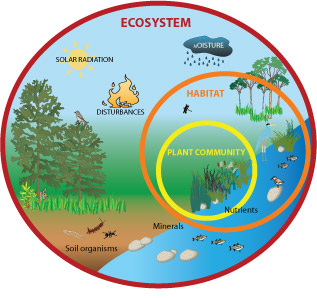 Ecosystems contain communities of living plants, animals and micro-organisms (e.g. fungi and bacteria). These living species interact with their non-living environment (the water, rocks, light, minerals and nutrients) and work as a unit. Ecosystems vary in size. They could be as small as a puddle, or as large as a tropical rainforest. Generally, all ecosystems are connected and maintained by water. Ecosystems with high species diversity are less likely to be seriously damaged by human interaction, natural disasters and climate changes e.g. a drought, flood or pollution incident. Every species has a role in its ecosystem. When we talk about wetland ecosystems we refer to a variety of habitats that include water bodies such as rivers and streams, canals, lakes and ponds, but also habitats that are characterised by permanently or temporarily wet soils, including bogs, swamps, reedbeds, marshes, and floodplain meadows. Freshwater ecosystems, with their rich natural resources, are vital for all living organisms and major ecosystems, as well as for human health, food production, and economic development. At a global scale freshwater ecosystems provide us with life supporting services worth trillions of US dollars every year - entirely free of charge. Put simply, ecosystem services are ‘the benefits people and businesses obtain from ecosystems’ (Millennium Ecosystem Assessment, 2005). Q. Can you think of anything that doesn’t require water in its production? With the global population expected to increase to nine billion by 2050, increasing pressure on water resources and threats posed by climate change, the need to maximise these benefits has never been greater or more urgent. Although freshwater ecosystems such as rivers, lakes and wetlands occupy less than 2% of the earth’s total land surface, they provide a wide range of habitats for a significant proportion of the world’s plant and animal species. We all benefit from healthy and productive ecosystems. The following video from the UN during the 2010 International Year of Biodiversity explains the importance of biodiversity and ecosystem services for species and human well-being. Q. What do you consider are the five most important uses of water? Q. Was it easy to come up with your list of 5? If not, why? Many freshwater species are still to be discovered. Yet, accelerated loss of biodiversity , predominantly due to human interference, threatens the ability of ecosystems to continue providing essential natural services. Physical alteration, habitat degradation, excessive water withdrawal and pollution have contributed directly or indirectly to the decline in freshwater species. An Adopt-a-River program challenges citizens to become personally involved in basic care and appreciation of our water resources. Such programmes connect people to the outdoors as they make regular visits to parks, streams, rivers, canals and fishing areas. These ecosystems, together with adjacent flood plains are part of the local watershed, and require care and monitoring. Adopt-a-River programmes are for everyone including individuals, families, students, recreationists, service groups, businesses and conservation organisations. Urban parks and other urban green spaces provide spiritual, aesthetic, educational, and recreational benefits for city dwellers as well as ecologically important services such as water purification, micro-climate regulation, wildlife habitat and carbon sequestration. Well-managed urban parks and rivers may vastly improve otherwise highly urban landscapes. They are also a good example of an approach that combines flood management, biodiversity enhancement and adaptation to climate change within a city environment. The Xochimilco Ecological Park in Mexico City shows how positive links can be achieved between healthy ecosystems and sustainable approaches to land use. Restoring a large area of urban wetlands has enhanced the health, wealth and environmental well-being of nearby communities. Significant improvements in water quality have enabled local communities to set up a thriving plant and food market and raised the profile of ‘agro-ecological’ projects worldwide. We are learning about new species every day and we are starting to understand the roles they play in the natural world. Research into the value of services provided by ecological systems has gathered pace in recent decades. There is a wealth of information available about the subject, much of which forms on-going work to inform how we might better use our natural resources in future. 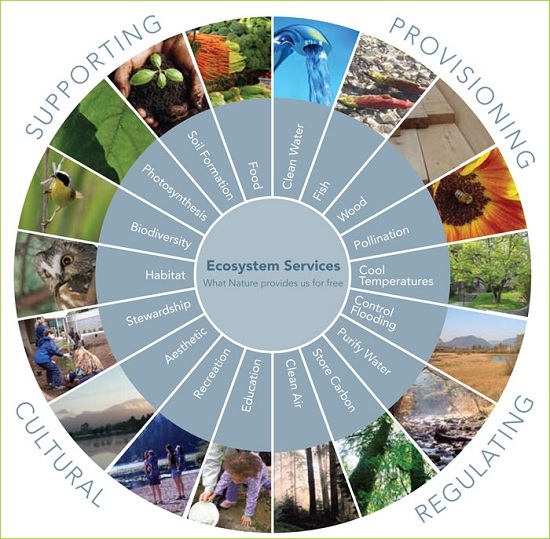 The Millennium Ecosystem Assessment has synthesised information from scientific literature and datasets to produce a comprehensive overview of global ecosystems services. It incorporates knowledge held by the private sector, practitioners, local communities, and indigenous peoples. Ramsar Convention on Wetlands - information on wetland ecosystem services. Water Security and Ecosystem Services: The Critical Connection - find out more about the importance of water in supporting human survival and economic livelihoods, as well as water needs of ecosystems. Next > Water: A Limited Resource?